Sometimes, no matter how well you take care of your hair, you come across a problem that robs your locks of their healthy, gorgeous looks. To eliminate these problems and protect your hair against further damage you need to be ready with an all-natural remedy that can restore the health of your hair. Pollutants in the air, hair product build-up, and over-styling can rob your hair of its natural shine and leave you with boring, dull locks. Instantly add shine and boost the looks of your hair with a simply shine restoring natural hair remedy. 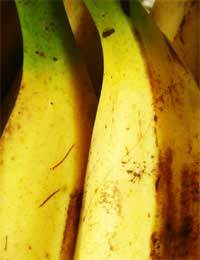 A banana paste can perk up dull hair in just one treatment. Simply mash one ripe banana with one teaspoon of olive oil. Massage the paste evenly through your hair and allow the mixture to set for fifteen to twenty minutes. Shampoo, condition, and style your hair as usual and you will be rewarded with healthy locks and lots of shine. Another great shine boosting treatment calls for a bit of honey. Simply dilute two tablespoons of honey with 2 pints of distilled water to make a hair rinse that moisturises hair strands and adds tons of shine. After shampooing simply rinse the hair in the honey mixture, allow the treatment to set for five minutes and then rinse it out with plenty of warm water. Dry and style as usual for healthy looking hair. If your hair is in need of some body, fullness, and volume you can whip up a hair treatment with beer that will definitely add oomph. Beer contains hops and malt that can absorb into the hair and coat and thicken the hair strands providing extra thickness and body. Choose an inexpensive beer that has the least amount of order and open the can or bottle to allow the beverage to go flat. Once the beer is flat pour it over freshly shampooed hair and massage the liquid into every hair strand. Let the beer set on the strands for five minutes and then rinse the hair thoroughly with lukewarm water for five minutes. Dry and style as usual for boosted volume. If frizz is leaving your curly locks uncontrollable tame them with eggs! The fatty acid found in eggs can smooth the hair cuticle, condition the hair strand, and ban frizz from even the most unruly hair. Simply beat one egg with two tablespoons of olive oil and apply the mixture to your hair. Comb through with a wide toothed comb to coat every hair strand and allow the treatment to soak in for at least 20 minutes. Rinse hair thoroughly and style as usual. Hair that looks dry, brittle, and damaged needs an intense treatment to restore soft, healthier looking locks. For this hydrating treatment simply mix one tablespoon avocado oil, five drops of rosemary essential oil, one tablespoon lemon juice, and one teaspoon of aloe vera gel (that you have squeezed from an aloe vera plant). Stir the ingredients well and apply the paste to your hair massaging in the mixture to ensure that all hair strands are evenly covered. Allow the treatment to absorb for twenty minutes and then shampoo, condition, dry, and style as usual. For really damaged hair you may need to repeat this treatment once or twice a week for a month. Even the healthiest hair can be plagued by split ends. Long hair, over-processed hair, and over-styled hair are all at risk for this health zapping condition. But, you can keep your hair strands looking healthy longer with a nourishing hair mask. To eliminate split ends you need to hydrate and coat the protective cuticle that surrounds the hair strand. To make a protective hair mask mix one half cup mayonnaise, two tablespoons of olive oil, one egg yolk, and one half of a mashed avocado. Apply the past to the bottom third of your hair and massage to coat each strand. Allow the mask to penetrate for thirty minutes then wash, condition, and style as usual. Apply this hair mask at least once a month to keep cuticles healthy and prevent split ends. Dandruff is a problematic hair condition that can ruin even the best hair day. This condition is caused dry, dead skin cells accumulating on the scalp. When skin cells die they usually flake off, however, dead skin cells on the scalp can be trapped in place by hair strands and cause build up. As new cells die they push old cells off causing dandruff. The best remedy for this condition involved hydration and exfoliation. To naturally treat dandruff first start by hydrating the scalp with a hot oil treatment. Simply warm a fourth of a cup of olive or avocado oil and apply to the scalp. Massage the oil in using your fingertips to loosen the dead skin cells and hydrate the healthy skin. Rinse the oil with warm water. Then, complete the removal of the dead skin cells by rinsing the scalp with one half cup white vinegar. The acidity of the vinegar will further loosen the dead skin and allow the dandruff to be washed away. By choosing the right natural ingredients you can fight even the worst hair problems and still maintain a hair and environment healthy routine.